This was a really good post, by Jane Roper over at Grub Street Daily: What is women’s fiction, and what does it mean to be a “women’s fiction” writer? Likewise, books that focus primarily on the relationships and emotional lives of men, whether written by men or women, are called Men�s Fiction. Just kidding. They�re not. They�re called fiction. And they�re marketed to and read by both men and women. As a soon-to-be indie author, I won’t get the freedom of letting someone make this decision for me. I don’t get to pass the “sell-out” buck to my publishers, and claim that “Oh, I hate the terminology too, but you know, my publishers get to make that decision.” Nope, I am my publisher. So whether my books are marketed as “women’s fiction” or “chick-lit” or something else is entirely my decision alone. I do have to say, there would be some strong advantages to having a clear-cut divide between the author’s personal ethics and the publisher’s need to market the book in the most effective way possible. Because you know what? Dammit, women’s fiction and chick-lit SELLS! And it’s a clearly-defined market that I think my book would slot nicely into. As a feminist, this puts me in a sticky spot though. I could refuse the label (as I’ve often seen Nicholas Sparks do in interviews, lol! ), but I don’t want my book to live in obscurity. Being an indie author, I’ll be obscure enough as it is. I’d love to use genre marketing to my advantage, but yes, it does make my skin crawl to call my book “chick-lit”. “Women’s fiction” is slightly better, though still not perfect. I’m now beginning work on my book’s cover, which I’m quite smitten with the idea of. There is no pink on it, no shoes or dresses or shopping bags either. Not even a cocktail glass. (Though there are definitely some cocktails in the book!) At one point, I thought there might be some hearts on the cover, but no, I’ve decided against it. 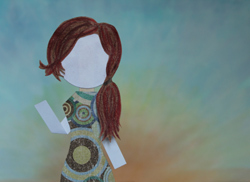 What there is, if I might be cryptic: hand-made paper stick people and a watercolor painted sunrise. (Really, you’ll just have to see it, lol!) The cover is going to be quirky, a little bit dorky, a little bit more funny, charming (hopefully), and as an undertone, both romantic and deeply sad. And well, that actually captures the mood of the book quite perfectly! I suppose I’m designing the cover to fall more in line with literary fiction titles, while keeping the fun and emotion-rich sense of women’s fiction. If I want to be honest with myself, the book is probably cross-genre anyway. I do hope some men might read my book. (There’s no pink on the cover, and quite a lot of blue, so maybe they wouldn’t be too embarrassed to carry it around? And one of my three main POV characters is a man!) But I also imagine many more women will enjoy it. I am quite confident that women who read chick-lit and women’s fiction will *really* enjoy it. Perhaps I don’t agree with what the market has been named, but regardless, it’s one of the markets I’m writing for, a valid market that has a powerful fan base, and I’d be a fool to turn my nose up at them. Not only just a fool, I’d be denying both myself and my readers that special chance to connect with each other. So, if you write relationship-based fiction, how do you feel about the label? What would you call it instead?